Great Vacation! We enjoyed tour stay. 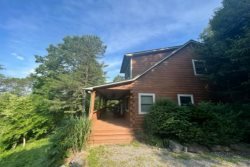 Cabin is in a great location - secluded yet close to many attractions. Every time I have ever contacted the staff they have been helpful, professional and very friendly. All of us thought the cabin, Bruins Den, was comfortable and cozy, it felt like home. The view was wonderful and the front porch was used a lot. There were absolutely no complaints and everyone is talking about when we can return. Response time very quick. Really helpful! TEAM IS VERY NICE AND EASY TO WORK WITH. The best first experience in a cabin and traveling in the mountains. We enjoyed ziplining and rafting, nature trails, and the beautiful waterfalls. We were also lucky to see a deer up close. The view here is great adn we hope to be back with the entire family soon. We very much enjoyed our long weekend at your gorgeous cabin! It was very relaxing. The view is amazing and loved the outdoor kitchen. Thanks so much for allowing us to stay here at Bear Bottom Chalet. We had a great time! Loved the cabin. Hiked the trails to the falls and hung out in Bryson City. Great place to get away from the city life we will be back in the summer to take advantage of the tubing. After Visiting Chicago, St, Louis, Memphis, Nashville, This cabin was exactly what we us and our daughter needed. We loved the hot tub and the view the best. We had an amazing time here. We did a lot of relaxing, a lot of eating and a lot of fishing. Thank you so much for allowing us to enjoy this wonderful cabin and beautiful view! We are so thankful. We had an amazing time. Saw so many beautiful thins. A much needed vacation. We can't wait to come back. I took my family up to the mountains for my daughter's 18th birthday. We enjoyed our visit immensely. The cabin is absolutely amazing and we couldn't have asked for a better weekend. My husband and I rented the Mountain Aire cabin for a four day getaway. We were looking for something quiet with a view and hot tub and close to Bryson City. It was perfect! The cabin was clean, well-appointed, the hot tub was sparkling and huge and the view was fantastic! We enjoyed sitting out on the porch and in the hot tub - there was a great breeze which seems to always be just right. We'll go back for sure - in fact, we plan to stay for a week next time and do some hiking! It's also close to trail heads!